Blankman (1994): Any time you can get Damon Wayans and David Alan Grier together you know it's going to be a good show. This is true of TV series' "In Living Color", "Damon", and this movie. It's a funny superhero spoof that's thoroughly entertaining. 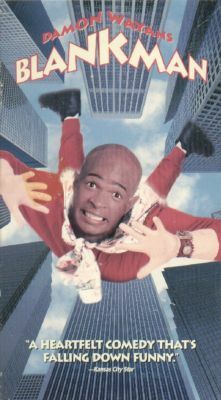 Only one question: How come Wayans didn't make this a movie about his crippled superhero character Handi-Man from "In Living Color"? I'm guessing that idea was considered, but scrapped. A feature film about a handicapped, retarded superhero would most likely be boycotted by people with no sense of humor (which is most people, sadly).